All the personality of a traditional signet ring with half the bulk (and considerably less grandpa). Instead, the Initial Ring pairs well with others, making it the perfect match for your skinny stackers– though it looks equally as nice on its own. Add an initial to represent your surname; the perfect little heirloom to keep in the family. Our Initial Ring features a 5.5mm round, 1mm thick solid gold disc on a 1mm rounded wire, which can be engraved for a personal touch or kept plain-faced. I’m so in love with this ring! It’s smaller than I expected in a totally great way. My friend and i purchased it as our friendship rings so i have her initial and she has mine and i absolutely love how subtle the letter is but how it reminds me of her when i see it. Unfortunately the ring itself is a little too big because they were sold out of my size but even so I still love this ring. 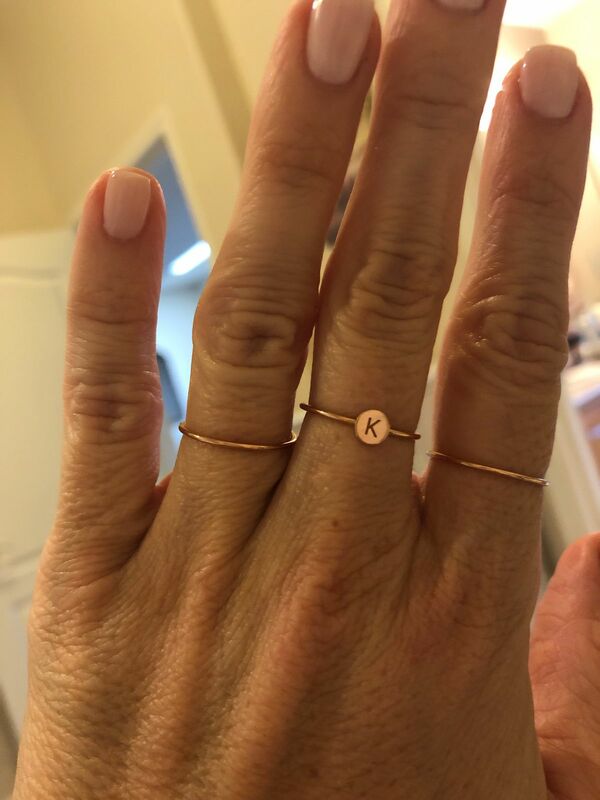 Kristin E. Reviewed by Kristin E.
Ring and just like all my other Vrai and Oro pieces, I never take them off. Like... ever. To bed, in the shower, vacations, etc I’m ALWAYS wearing them. The quality is outstanding and not like other places wear the rose gold wears off. I mix with yellow gold and the rose gold compliments all the yellow gold. Just perfection. Truly love this item and am thrilled I found this vendor and product! Quality and pricing is fantastic! Amber V. Reviewed by Amber V.
This is such a beautiful gift for a teenager! It’s beautifully made and very stylish! I absolutely love my ring - it is beautiful and arrived so quickly. Thank you! Will definitely be shopping with you again.